For those readers who now have the Lite-Brite song stuck in their head, I apologize, but if it makes you feel any better, I’ve had it running through mine for the past couple of days now. It’s kind of amazing how impressionable young minds can be to obnoxiously catchy jingles. It’s also amazing how susceptible adults are to nostalgia, because when I first caught sight of this app, I was embarrassingly excited to rediscover this colorful slice of my childhood. For those of you who have no clue what I’m talking about, Lite-Brite is an electric toy that’s probably been around since the 60’s. It mainly consists of a light bulb installed behind a black grid of holes and a number of colored pegs. You insert the pegs to make a picture and when you turn on the light, voila! The light shines through the pegs and makes the whole image glow in candy-colored hues. It came with a number of templates of various pictures, but the size of the grid-holes meant that images were generally crude and clunky at best. Still, I loved my Lite-Brite, since the pegs were just the right size to let little fingers and big imaginations go wild. It was like painting with Christmas lights. Today, kids have much more sophisticated drawing toys available to them, but that hasn’t stopped Hasbro from bringing the classic Lite-Brite experience to the App Store, along with a few updates to keep things interesting. 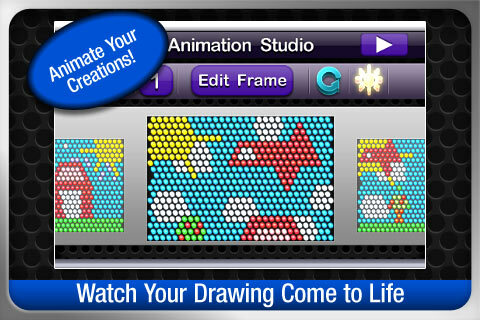 In addition to a standard free draw mode, there is also a template mode and animation studio. When using the templates, you have the option of just drawing with them like a coloring book, or you can use them in a timed paint-by-numbers mode, where you fill in the colors according to their rules. The time trial mode is a little frustrating, only because it’s difficult to see where you might have made a mistake once you’ve put a peg in. The animation studio lets you bring your creations to life, but the interface is supremely clunky, so it won’t be of much use to any but the most painstaking and detail-oriented personality. Broadly speaking, the Lite-Brite app just isn’t anywhere near as satisfying as the actual toy. It looks quite nice, but the basic pegboard interface is awkward to use, requiring an adept mastery of two-fingered tapping, painful precision dragging, and tiny fingers for selecting the various peg colors. It is, however, far more portable and less messy than the real thing. There are no parts to lose and clean-up is a snap. That said, making pictures with the app requires a Herculean amount of patience that few children possess, so while it definitely satisfies that nostalgic yearning for a simpler time, I doubt your children will appreciating having your old toys stuffed down their throats, even with the bright and shiny new touch interface. 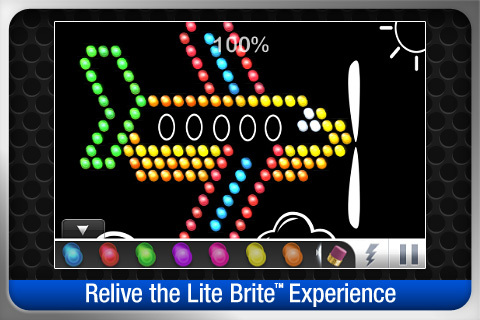 AppSafari review of LITE-BRITE was written by Tracy Yonemoto on October 8th, 2010 and categorized under App Store, Art, Games, Line Drawing. Page viewed 4091 times, 1 so far today. Need help on using these apps? Please read the Help Page.